who participated, read and commented. I was my pleasure to host such an eclectic group of label, coaster and cap art enthusiasts. If there is anything I need to correct please let me know, you know where to reach me. Casual onlookers: please visit all these blogs below and comment on their work, it is the only way we know anyone is "really" reading our work! Minimalism and Belgian IPA's? 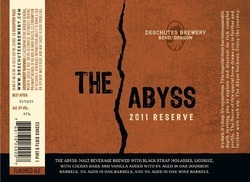 Quite the contrast but the description of this beer should put this beer on anyone's list. Jon likes the understated but only if it makes him salivate! Sean "blatantly ignores the directions" (his words not mine)and brings us a tale of two cans. I, for one, am glad he did. Cans are becoming such a big part of craft beer we can't ignore them forever. 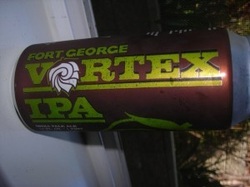 That and I had the pleasure of tasting Vortex this summer, YUMMY! Alan talks about his time in Poland teaching kids English and about fitting in abroad and of course beer label art. Greg has picked some of my favorite labels from "He'Brew". And I am glad he included the examples from their "freak show" series. Not only does he talk about really cool labels he also gives us a heads-up on a freaking awesome beer festival. Beer Sagas loves coasters or beer mats (a new term for me today)and most come from his favorite beer destination. Can you guess where that might be? But you will have to visit his blog to see his favorite. Derrick claims he is no expert on art or graphic design but I beg to differ. His commentary is short, sweet and genius! For Kathleen it is all about location. She steps out of her beer comfort zone when she travels and enjoys the ride, some of the time. Thanks for the post, Mom. The Reluctant Scooper dishes about his favorite Summer beer (It happens to be mine also) and understated straight forward label designs. Steve from Beers I've Known is another Odell art fan. He also notices art on caps, take a look and see if you spot a theme. It's a hoot! Jason takes a look at raging, sophisticated, classic and seasonal labels influence your mental attitude of the beer within. While this entry doesn't expound on any given label or coaster or cap (yes cap;-) it does talk about the importance of branding. Dominik from Lautering.net looks at labels from the graphic designer perspective. He makes some good points that breweries/homebrewers should consider when they create labels. Russian mobsters and vintage Thomas Hardy! What a beer life some have lived! Cask|Crusade gives a nod to a craft beer pioneer! 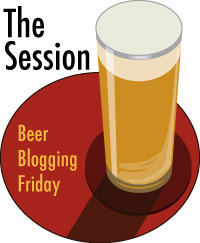 Barley Blog has provided a diverse selection of label art for us today. 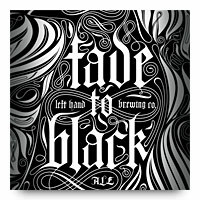 Prepare to be mesmerized by the Fade to Black series of Left Hand and then calmed by traditional woodcut art from Odell. It is the best of both worlds today when the beer you pick to blog about has a label and a cap that fulfills your writing assignment. Find out why Bell's Hopslam made the cut. I love it when people geek out on details like typography. Who knew a beermat, or coaster here in the US, could be so evocative? And a "The Fly" reference that is brilliant! The gargoyles of Stone Brewing are mesmerizing for Rick. I love the story this label tells as well as the questions it poses. But that isn't all. I also included my favorite coaster and cap. I’ve decided to go retro. I want to remember beer from the 1970s, as forgettable as most of it was. Growing up in Washington State in the 1970s, before Coors had national distribution, I remember my parents telling friends coming from Idaho “you’ve got to bring us Coors!” Was that really the best we could do in the 1970s? For the most part, yes! Growing up in the Northwest we were “blessed” with some regional breweries like Rainier (known for its outstanding advertising) and Olympia (“It’s the water, and a lot more”). It was nothing like the riches we have today when we walk into a supermarket or specialty beer store. Remember that it was not until the late 1970s that Jimmy Carter signed bill legalizing home brewing and winemaking, which led to the craft beer revolution. 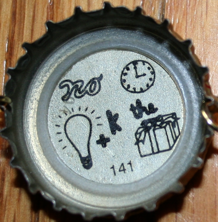 One thing I remember as a kid—my parents, relatives, and all their friends drank a lot of beer—are the rebus puzzles that would appear in beer bottle caps. As kids we could not wait to decipher the hidden messages. If you are interested in seeing more of these—and deconstructing some of the less than politically correct images that were used—there is a terrific site with hundreds of them. I am kind of surprised that more breweries these days do not use their beer caps in such a creative way. Some, like Magic Hat, will put witty little sayings in the caps (and that is cool), but these little puzzles and jokes were just a blast. The 1970s were marked by economic recession after economic recession. During those years frugality was encouraged, and marketing companies played to the demand for reasonably priced products. One such product: Generic beer. “Beer Beer” as we called it. The argument was that the price of beer (and any number of other products) could be kept low for consumers by neglecting all the fancy designs and packaging. The words on the can or bottle let you know what it was: BEER. What was in the can was not so fancy either. Lucky brand beer I am told. It was awful stuff, but it was cheap. Standing outside the local Albertson’s asking grown-ups to buy us some beer for the few dollars we had, Beer Beer did the trick. I think I have succeeded in choosing the least impressive label possible! The craft beer industry flourished in the Great Northwest beginning in the early 1980s. One of the first craft beers to make an appearance around town was Redhook’s Ballard Bitter. I’ve always loved that Ballard Bitter label. It speaks volumes about my hometown. Ballard is a neighborhood in Seattle that—back in the day, before it became yuppified—was home to many Scandinavian immigrants and their descendents. The “Ya Sure Ya Betcha” slogan was a tip of the hat to the working class folks that lived in the area. The “Bitter,” of course, referred to the fact that this was an IPA. Of course Redhook is a national brand, and the Ballard Bitter appellation is replaced by the more generic Long Hammer name.